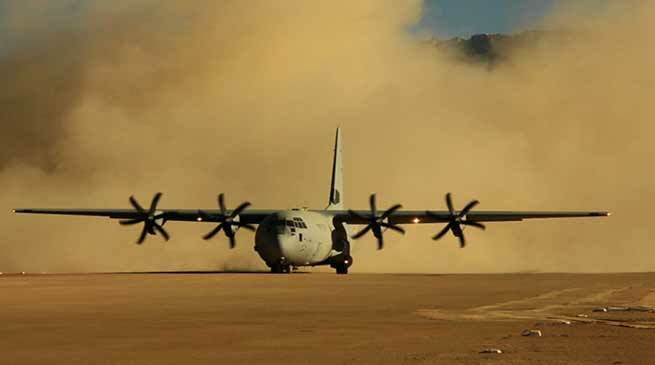 As part of the ongoing massive IAF exercise ‘Gaganshakti-2018′, fighters, helicopters and transport assets have been deployed at the Advanced Landing Grounds (ALG). The ALGs are short prepared / unprepared airstrips close to the borders in the valleys, which have limited rail/road connectivity due to challenging terrain. ALGs located strategically offer an opportunity for swift mobility of troops and equipment close to our Northern and North Eastern borders. A large number ALGs have been operationalised and are being utilised for conducting Inter Valley Troop Transfers (IVTT), Special Heliborne Operations, Air Landed operations and Special Operations by SFs, close to the simulated objective areas. SU-30s have also been operating from most ALGs in the NE sector. The full gamut of support services has been mobilised & operationalised at these ALGs for seamless conduct of these operations. The challenges faced by our pilots in landing at these ALGs are unpredictable weather, undulating terrain, narrow corridor of approach / manoeuvring and short runway lengths. Braving these odds, the IAF pilots are undertaking these daring operations with extreme precision and professionalism, thus giving strategic fillip to these tactical operations. IVTT operations were carried out in Uttar Bharat Hills and at the Tezu-Walong in the North East sector. The support to these operations was possible due to the presence of ALGs at these strategic locations. This exercise has proven to be an excellent opportunity for honing the skills of our aircrew and the support services to carry out these exacting operations.